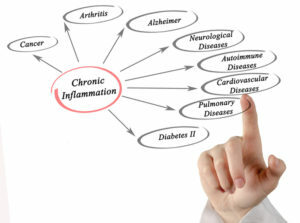 A wide array of diseases have been linked with chronic inflammation. Follow an anti-inflammatory lifestyle to reduce your risks. Chronic inflammation is behind myriad conditions that plague us. What causes it? Lack of exercise, a poor diet, obesity, smoking, stress, and sleep disorders all can contribute. Your immune system is like a home security system. When you suffer an injury or infection, it sets off an alarm—what we know as an inflammatory response—by sending immune cells to neutralize viruses, bacteria, and other intruders that breach your outer defenses, thereby protecting healthy cells and tissues from damage. Essentially, inflammation is part of the healing process, and without it, our injuries and illnesses would never heal. That’s the good part. The bad occurs when you experience chronic inflammation. Chronic inflammation can persist for months or years. In such instances, the immune system engages in a prolonged “friendly fire” of sorts, damaging cells and tissues throughout the body over time. 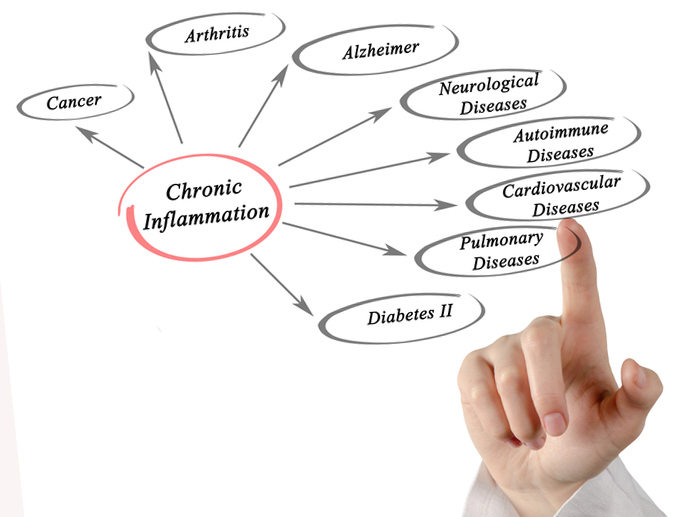 The chronic inflammation process has been linked to a broad array of diseases, some of them life-threatening. 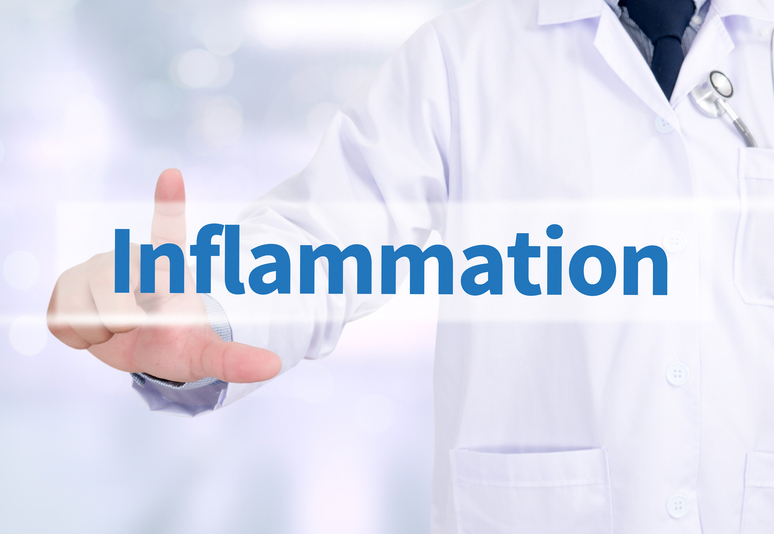 While inflammation from an acute injury may manifest as pain, swelling, redness, and other symptoms, chronic inflammation can go unnoticed and unchecked for years. Fortunately, you can reduce inflammation in your body by eating a healthful diet, getting regular exercise and adequate sleep, and finding ways to minimize or conquer stress in your life. Following an anti-inflammatory lifestyle can help you feel better and, in some cases, may reduce your risk of chronic disease. More than half of Americans are deficient in magnesium, a mineral that the brain requires to support its metabolic processes and cognitive functioning. Deficiency is thought to increase with age and possibly contribute to age-related cognitive decline. Research in animals has linked higher consumption of magnesium with greater brainpower, slower cognitive decline associated with aging and disease, and significant improvements in learning and memory, along with greater density of connections among brain cells in a key memory region called the hippocampus. In studies involving humans, a low dietary intake of magnesium has been linked to greater risk for cognitive impairment and dementia, and people with Alzheimer’s disease (AD) have been found to be more likely than healthy individuals to have low blood and brain levels of magnesium. Recent research suggests that magnesium may directly interfere with processes in the brain that lead to AD progression. A study published in the December 2015 issue of The FASEB Journal found that mice given supplements of magnesium-L-threonate (MGT) experienced a marked reduction in the formation of toxic beta-amyloid proteins, a hallmark of AD, and significantly slower progression of cognitive decline. Although animal research does not always translate to humans, mounting evidence suggests that taking steps to ensure adequate magnesium intake may be a good way to ensure optimal brain function. Because magnesium levels can be depleted by stress, poorly controlled diabetes, alcoholism, Crohn’s disease, older age, and certain medications, among other factors, the Office of Dietary Supplements of the National Institutes of Health suggests some individuals may need to take dietary supplements. If you think you may not be getting sufficient quantities of magnesium in your diet, a medical assessment should help determine the need for magnesium supplementation. What Is a Chronic Inflammatory Condition? Chronic inflammation may arise if the source of acute inflammation is not removed from the body, or if you experience prolonged exposure to chemicals or other inflammatory agents. Digestive diseases: A wayward immune response produces inflammation that damages the intestinal lining (causing Crohn’s disease) and the colon (resulting in ulcerative colitis). An abnormal immune sensitivity to gluten (a protein in wheat, rye, and barley) triggers inflammation that causes celiac disease. (See also Gluten Free & More‘s post on how to reduce inflammation.) And, in the mouth, where the digestive system begins, inflammation from periodontal disease can wreak havoc on your gums. Respiratory diseases: Asthma is characterized by chronic inflammation of the bronchial tubes, while prolonged inflammation in the sinuses leads to the pain of chronic sinusitis. An abnormal immune response also is to blame for seasonal allergies, such as hay fever. Diabetes: Type 1 diabetes is an autoimmune disorder that damages insulin-producing cells in the pancreas. In one study, researchers identified chronic inflammation of the digestive tract and unique changes in gut bacteria in people with type 1 diabetes (Journal of Clinical Endocrinology & Metabolism, January 2017). “Our findings indicate the individuals with type 1 diabetes have an inflammatory signature and microbiome that differ from what we see in people who do not have diabetes or even in those with other autoimmune conditions, such as celiac disease,” the study’s senior author, Lorenzo Piemonti, MD, of San Raffaele Hospital in Milan, Italy, said in a statement. Studies also have found higher levels of inflammation in people with type 2 diabetes, the most common form of diabetes. Skin disorders: Inflammation is at the root of several skin diseases, including psoriasis, eczema, and rosacea. Joint diseases: Chronic inflammation, pain, and joint damage characterize rheumatoid arthritis as well as ankylosing spondylitis, a type of inflammatory arthritis that affects primarily the spinal joints. Inflammation caused by uric acid deposits in the joints leads to painful gout flare-ups. And, inflammation from another autoimmune disorder, systemic lupus erythematosus (lupus), can harm the joints, as well as the heart, lungs, blood vessels, kidneys, skin, and brain. Other research suggests that inflammation can have deleterious effects on the brain and might play a role in Alzheimer’s disease. Furthermore, high levels of inflammation are common in people with depression, suggesting a role of chronic inflammation in the development of depressive disorders. Several investigations have found that chronic inflammation plays a role in atherosclerosis, or “hardening” of the arteries, and that people with elevated levels of inflammatory markers are at increased risk of cardiovascular events, such as heart attack and stroke. Experts believe your immune system perceives fatty, cholesterol-laden plaques lining your artery walls as abnormal, and it sends white blood cells to shield them from your bloodstream. However, this inflammatory response can make the plaques vulnerable to rupture, spilling their contents out into the bloodstream and exposing parts of the vessel wall not normally in contact with blood. This process can trigger platelet activation and formation of blood clots that may cause heart attacks or ischemic strokes. Chronic inflammation also may factor into DNA damage and gene alterations associated with several types of cancer. For example, having inflammatory bowel disease (ulcerative colitis and Crohn’s disease) significantly increases the risk of colorectal cancer; chronic inflammation of the liver (hepatitis) increases the risk of liver cancer; and inflammation of the esophagus (Barrett’s esophagus) is a known risk factor for esophageal cancer. Additionally, researchers have found pockets of inflammation in cancerous prostate cells. Research into inflammation’s role in cancer continues. What Could Cause Inflammation in Your Body? A poor diet: What you eat may contribute to inflammation. Avoid pro-inflammatory foods, such as high-fat red meats, full-fat dairy products, fried foods, processed foods, and added sugars. Instead, consume plenty of antioxidant-rich fruits and vegetables (good examples include beans, broccoli, leafy greens, blueberries, oranges, and strawberries) that have anti-inflammatory properties. Replace unhealthy saturated and trans fats with healthier fats: Use olive oil instead of butter, and consume anti-inflammatory omega-3 fatty acids (found in salmon, mackerel, tuna, and other cold-water fish). Lack of exercise: People who lead sedentary lifestyles tend to have higher levels of inflammation. But, increasing your physical activity can reduce inflammation. In fact, in one study, researchers reported that people who regularly adhered to guidelines recommending at least 2½ hours of moderate-to-vigorous physical activity a week had significantly lower levels of two inflammatory markers—C-reactive protein and interleukin 6—over a 10-year period as compared to those who did not adhere to the guidelines (Circulation, Aug. 21, 2012). Obesity: Fat cells aren’t just inactive storage centers, but rather tiny factories that produce inflammatory chemicals called cytokines. The inflammation resulting from an overabundance of fat cells may explain, in part, obesity’s connection to several chronic diseases, including cardiovascular disease, type 2 diabetes, and certain cancers. If you’re overweight or obese, work with your healthcare team to lose weight via a healthy diet, exercise, and, if necessary, medical weight loss therapy. Smoking: Cigarette smoking and exposure to secondhand smoke can increase inflammation. If you smoke, ask your physician about nicotine replacement therapy, medications, counseling, and other strategies to help you kick the habit. Emotional stress: Anxiety and stress are well known risk factors for chronic inflammation. In one study, researchers reported that stress can inhibit the body’s ability to use the hormone cortisol to manage inflammation (Proceedings of the National Academy of Sciences, April 2, 2012). “Inflammation is partly regulated by the hormone cortisol, and when cortisol is not allowed to serve this function, inflammation can get out of control,” study author Sheldon Cohen, PhD, of Carnegie Mellon University, said in a statement. Tell your doctor if you chronically feel anxious, and work on ways to manage the stress in your life. Consider stress-relieving techniques such as mindfulness meditation, or simply find a hobby you enjoy that can take your mind off your worries. Sleep disorders: Sleep problems, such as obstructive sleep apnea, have been linked with increased inflammation. Tell your doctor about any signs of sleep apnea, such as excessive daytime sleepiness, loud snoring, or interruptions in breathing during sleep (as reported by your bed partner). 2 diabetes, adequate sleep, allergies, alzheimer, anti inflammatory, anti inflammatory foods, antioxidant, anxiety, anxiety and stress, apnea, arthritis, asthma, atherosclerosis, bacteria, best foods for rheumatoid arthritis, blood clots, bowel disease, brain, c reactive protein, can ed be reversed, cancer, cancers, cardiovascular, cardiovascular disease, celiac, celiac disease, cholesterol, chronic inflammation, chronic sinusitis, colorectal, colorectal cancer, conquer stress, cortisol, dairy, daytime sleepiness, depression, diabetes, diabetes journal, diabetes type, diet, digestive, digestive diseases, digestive tract, eczema, emotional stress, esophageal cancer, excessive daytime sleepiness, exercise, gluten, gluten free, gluten free more, gout, gout flare, gut bacteria, hardening of the arteries, hay fever, healthy diet, heart attack, heart attacks, hepatitis, hormone, how do you test for prostate cancer, immune system, infection, inflammation, inflammatory arthritis, inflammatory bowel, inflammatory bowel disease, insulin, joint diseases, liver cancer, Lose Weight, loud snoring, lupus, meditation, metabolism, mindfulness, nicotine, obesity, omega 3, omega 3 fatty acids, pain, Pancreas, people with depression, physical activity, processed foods, Prostate, protein, psoriasis, reduce inflammation, respiratory diseases, rheumatoid, rheumatoid arthritis, rosacea, seasonal allergies, signs of sleep apnea, sinusitis, skin, sleep, sleep apnea, sleep disorders, sleep problems, smoking, snoring, stress, stroke, type 1 diabetes, type 2 diabetes, types of cancer, ulcerative colitis, uric acid, vegetables, white blood cells.